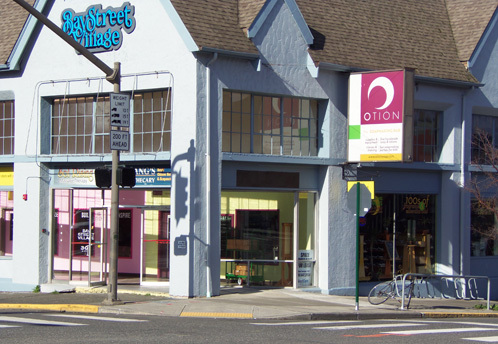 Otion has been in operation since 2004, but their Crafter’s Corner is brand new. The corner will be a project area where anyone can come in and make their own lip balms, nail polish and bath bombs right on the spot. These projects are great for all ages and skill levels, and knowledgeable Otion employees will be on hand to answer questions or troubleshoot. 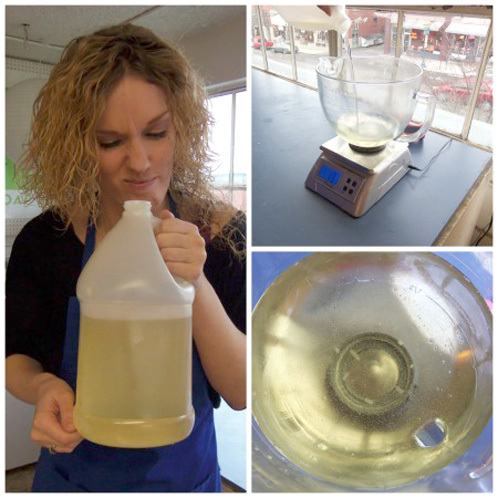 The new Crafter’s Corner inside Otion allows people to learn how to make their own bath & body products. 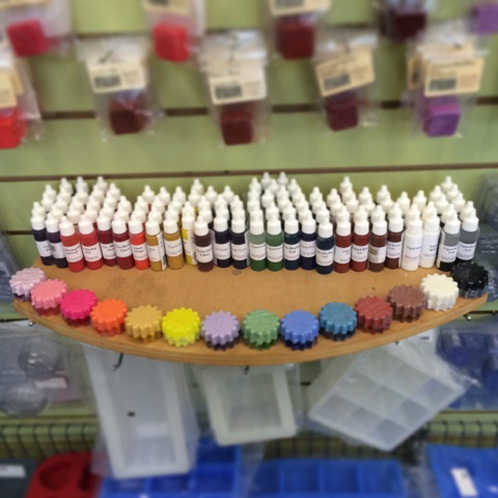 Kit prices range from $10 to $20 and come with instructions and all the supplies to make and take home fully finished projects. If you’re in the Bellingham, Seattle or Vancouver area, we encourage you to stop by and check out this fun event. If you can’t make it, Otion still has plenty of other activities happening year round. They have a fantastic blog with all kinds of soapy and crafty projects here (including this easy DIY air freshener project). Otion also teaches a variety of classes. You can find their full class list here. 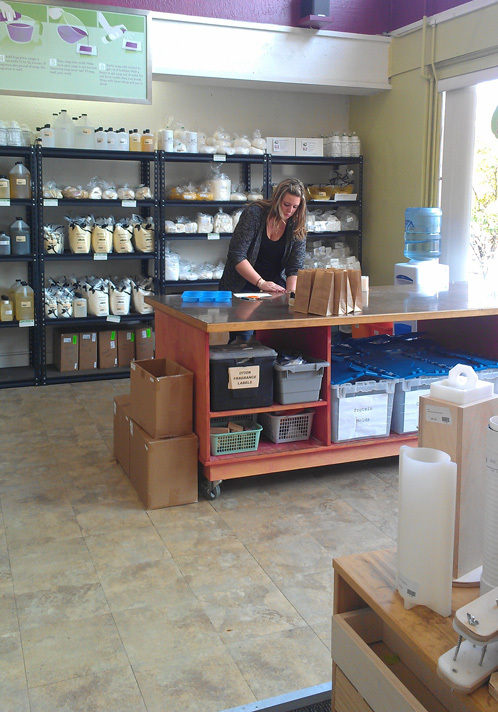 Karly, Otion’s manager, portions out some liquid oil and checks for freshness. Otion carries Bramble Berry fixed oils and waxes. 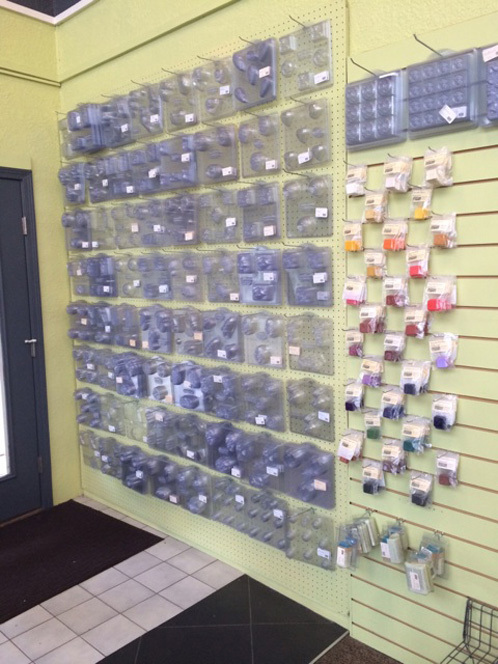 Otion carries a huge selection of Bramble Berry molds and colorants. This is their melt & pour wall. We hope to see you May 8 for the grand opening of Crafter’s Corner! Congras! Ever since I learned making soaps, lip balms, bath bombs at your workshop 10 years ago, I have have endless fun. I appreciated the variety of classes that you offered. Will drop by again to pick up some other classes. Awesome, it’s going to be so much fun! Congratulations on your new crafters corner. My husband took a personality quiz on the best places to retire and his city came up as Bellingham, Washington. He suggested we go there this year on vacation. Well, he didn’t have to ask twice! I didn’t believe it! I plan on coming by in June and taking a class or two. Thanks so much! That’s so awesome, Bellingham is a great place. I came here for school, and still haven’t left! It’s so beautiful, you guys are going to have so much fun! We are very close to Vancouver as well, I would recommend visiting Vancouver for a day as well. Are you planning on going to Seattle too? I soooo badly want, no, NEED one of these down the street from me! OK…I’m moving! Nothing even remotely close to this in Kansas!!! Would love to stop in!! So wish I could pop in but its a bit of a drive from Australia. Hope to make it one day tho! Congratulations. Sounds like so much fun. I wanna work there. Congrats! What a great idea. Wish I lived closer, I would be there in a heart beat. Corpus Christi, Texas just isn’t around the corner. We used to have a conference every year at Warm Beach but not any more otherwise I would come visit. Wish you much success. You deserve it for all the wonderful help and products you provide for all of us! Congrats to you and your Bramble Berry family!! The store looks awesome, love the fact the kits are there for the customers to purchase!!! Wished I lived in Bellingham, WA I would be at the Grand Opening; however, I live in Sacramento, CA and will have to hear about all of the great stuff via your website. I guess the next best thing is for me to continue to purchase your products via the internet..